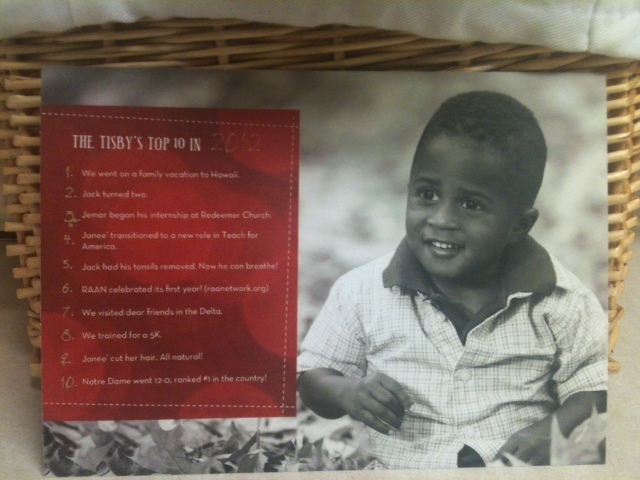 Our Christmas card each year is a postcard with pictures of our family on the front and a “Top 10 List” on the back. We list the top ten most meaningful events to summarize the year. For the past few years we’ve gotten to November, the time we order the cards, and we ask ourselves, “Okay, what happened this year?” This year I determined that list won’t be a surprise. I asked myself, “At the end of 2013 what ten events would I like to write down?” This question is a way for me to be purposeful about what my family and I do instead of simply letting events occur randomly. I want to happen to life, not let life happen to me. Even though the year is just getting started, I’ve already seen enough fruit to recommend a good, long, thoughtful planning session to anyone who wants to accomplish more this year. My plans have gone awry (in splendid and better-than-expected ways thanks to God’s kindness) enough times that I have lost any illusions of predicting precisely what will become of my goals. Yet we should not let the lack of certainty or control give us an excuse not to make plans and objectives for ourselves. It’s all right to plan. It’s even encouraged. Wise men and women consider the future and make plans in order to be responsible with the resources God has given them. To do otherwise leads to poverty. So I took an entire day in January to come up with some goals for the new year. My wife graciously granted me a night at a hotel in town so I could have some time alone (and so could she!). I used this time to pray, journal, and ponder the future. I came up with lots of goals for this year. They range from writing a certain amount of words per week on this blog to ways to spend quality time with my family. I’m surprised at the amount of focus I’ve been able to have during the first weeks of the new year. But my execution hasn’t been flawless. I’m making progress on some goals and I’ve been stagnant on others. Yet goal-setting has allowed me to get back on track instead of wandering the days and weeks aimlessly. If you feel like you’re floundering in busyness without anything to show for it. If it seems like you’ve hardly accomplished anything after a full month of the new year. Take heart. Try stepping back for a day, an hour, or even just a few moments and think about what you want to happen this year. Make that thought into a goal. You’ve just taken the first step to maximizing your impact. Previous postIt’s February–How Are You Doing on Your Goals? I love this idea for a Christmas card. It’s a nice way to share with family and friends the big things you did this year without getting into a long “newsletter” type format. Now trying to plan for this list with you “to-do’s” you should have a lot of interesting things to write about this year! Always be prepared for the future to change and have its own plans, though!